I’ve been counting calories for 7 months now. 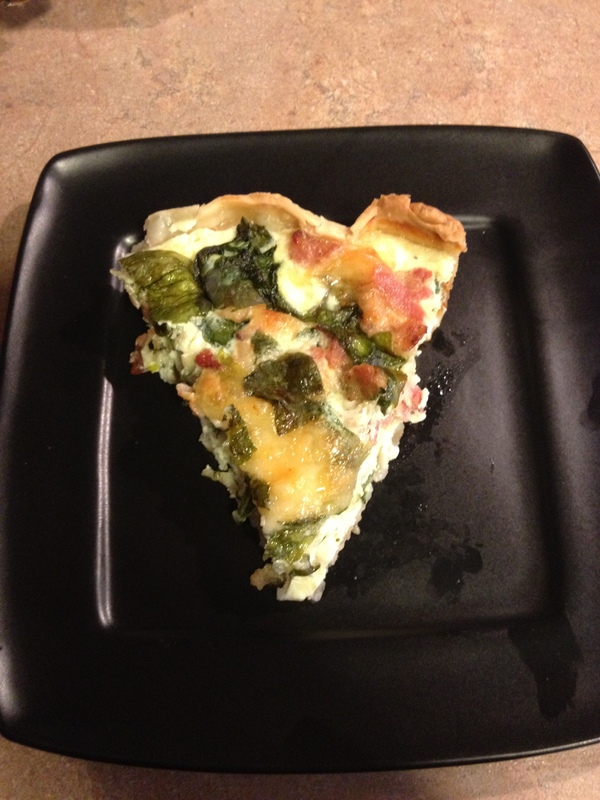 I’ve been able to “skinny down” a lot of the recipes i made before, but the one that alluded me the longest was my quiche. It’s REALLY hard to make a decent quiche without using full eggs or heavy cream. After my 9 year old begged me to make a quiche, it prompted me to skinny down this recipe and I’m so glad I did. I can see this previous favorite making it’s way back into regular rotation at our dinner (and breakfast) table! 2. Using kitchen scissors, cut raw bacon into small pieces. Fry bacon and drain fat. Set aside. 3. Use kitchen scissors to cut swiss cheese slices into small pieces too. Set aside. 4. Use kitchen scissors to cut baby spinach into smaller pieces. I roughly cut each leaf into 4’s. Set aside. 5. Unroll pie crust into a deep dish glass pie pan. 6. 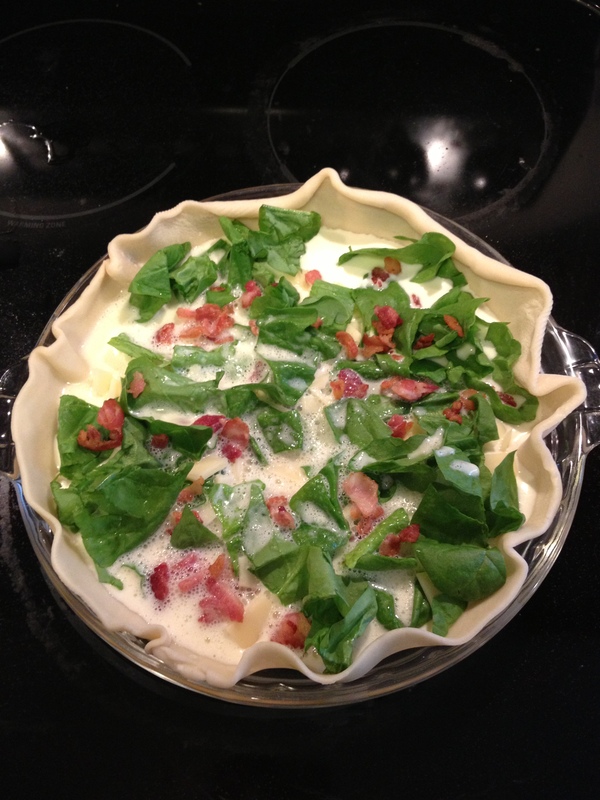 Place 1/2 spinach into crust, followed by 1/2 of bacon and 1/2 of cheese. Repeat layer. 7. Put Eggs, Egg whites, milk, salt & pepper, and yogurt into a blender. Blend just until everything is smooth. 8. Pour egg evenly mixture over other ingredients inside the pie crust. 9. Cover pan with aluminum foil and bake for 45 minutes. 10. Uncover pan and bake an additional 15 minutes. 11. Allow quiche to cool at least 5 minutes before serving. So… clearly I’ve been experimenting with my blackening seasoning lately (see previous post for Cajun chicken pasta.) Truth be told, my Cajun recipe kick may have begun with Cajun pasta, but the thought process all began sitting in a BRIO restaurant in Denver Colorado. 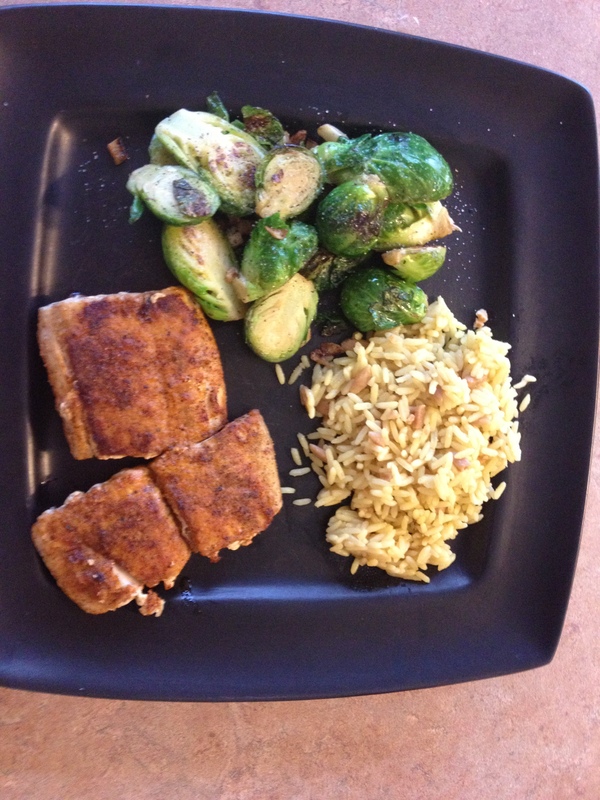 I went with the daily special, which happened to be blackened mahi mahi….and it was SO GOOD it prompted me to buy blackening spices and do this at home. The results were delicious. That’s it. Simple, quick. Delicious. 1. Mix flour and seasoning well. 2. Rinse and pat dry fish filets. 4. Coat fish liberally with flour mixture. 5. Place filets in hot skillet and allow to cook long enough to get a good crust on the first side. 6. Flip fish over and repeat until 2nd side is crusted. 7. Continue periodically flipping fish until middle is flakey and cooked through. About 11 min I think is what it took.